Click the image above to go to all of my other Wednesday Website posts. It’s been a few weeks since I’ve shared a new site with you on Wednesday Website, but this week I’m back with my new FAVORITE website! Let me start by explaining the technology that we have available to us. In our class we have 6 ancient computers that sometimes work, and sometimes don’t. The computers are at least 10 years old, at least. I am unable to update the browsers or any plug ins. They sometimes don’t turn on, or the keyboard or the mouse will suddenly stop working. I’m pretty technologically knowledgeable but other than making sure things are plugged in, my knowledge of hardware is lacking. We also go to the lab once a week for 30 minutes. Those computers are 10+ years as old as well. I have a tablet and a projector (thanks to DonorsChoose!) that I can use to teach from, but that’s all we have. It makes incorporating technology and keeping the kids engaged pretty difficult. But, we make the best of it. So when I find a website we’re able to use and use well, it makes me incredibly excited. This one has changed our math program. Seriously. I originally heard about Front Row after Erin from Kleinspiration did a post about it. I decided to sign up and try it out with my kids. After my kids used it a couple times, they fell in love with it, and I fell in love with it. We use it during our math block every. single. day. It’s a center and it allows kids to work on the math strand we’re working on, but at their level. Essentially, it allows me to give kids 30 minutes of differentiated practice at their level, and it takes virtually no work on my end. That’s life-changing in a teacher’s world right there. You can work directly on the website or they have an app available in the Apple store if you’re lucky enough to have iPads at your disposal. First, you register yourself as a teacher using your email address. Click on the registration and get yourself set up. Once you’ve verified everything, you’ll be taken to your dashboard. Once you are registered yourself then you type in each of your students’ names to register them. Just first and last name. Quick and painless. I think you can even import them from Excel, but it didn’t take me very long to just type them in. You will be given a class code that students will use to sign in. My kiddos tell me they only had to type it in the first time they used that specific computer. Bonus! I have it on the chalkboard above my computers that I made with website notes so if the kids ever need it, they have it handy. Here are some things the students see on their end. This is the sign in page. Then direct students to which domain you’d like them to practice in. This is my favorite part. We have been working on fractions the last few weeks so the kids have been in fractions. We’re going back to area and perimeter after break so I had the kids do a bit of work in Measurement. The first time a kid works in a domain they take the diagnostic test. This assesses where the kids are at with this specific math strand. It allows you to differentiate for the kids without having to do any additional work. It finds out where they are, and works on those specific standards, no matter the grade. Another awesome tool is the video. If a kid is struggling or not understanding a specific concept, they can click on the little “play” button on the left toolbar and a quick teaching video pops up to explain the concept. Amazing. Unfortunately, our ancient computers can’t seem to get this to work. Lucky for me, my kids don’t mind. They’ll just sometimes ask me for help or will ask a friend if they get really stuck. It also allows them to use manipulatives and scratch paper directly in the program. I do have to keep an eye on a couple kids to make sure they aren’t just playing around, but most of the kids are completely engaged. You see that little coin on the top? Kids collect coins each day for their work. When they enter in the program it gives a leaderboard for the daily coin collection. My kids LOVE it. They are so excited to share with me how many coins they’ve earned each day. What do they do with those coins? Nothing. Just earning the coins has kept them interested and excited about what they’re doing. My kids seriously CHEER when I tell them to get on Front Row. Here are some of my favorite features from a teacher viewpoint. Once you’re signed in you can see your dashboard with a toolbar on the left. Here is a look at the Analysis section. In this section, you choose a standard within the domain you’re working on. It shows your students’ performance on that standard. This is my students’ work with 3.NF.3d (don’t be confused by the KCC1 in the drop down. That’s just for me to choose the next standard). I’m quickly able to see who isn’t working up to that standard yet, and who has advanced. I’ve blocked out my student names but they are in that white box. Another cool feature is the Report Card. Here, you select the grade level’s standards that you want to see and everything on the screen is sorted by student. Here is one of my student’s report card. This is a second grade view of the measurement standards. This is where he’s working on this strand. And this is where he’s working on the 3rd grade fraction standards. Another cool feature is the printables. You’re able to choose if you would like to print an individualized printable for a specific strand so you get one for each student at their level. Or, you can choose printables for specific strands. In full discretion I do want to say that these printables are not very eye catching, and they could use some improvement to be a bit more student friendly. But, in a pinch they’re quality work. And, it’s free. One last awesome feature is that each week you get an email with information on how your students did that week. I’m pretty sure someone does this work and it’s not automated. Either way, it’s a really nice feature. I blocked out my student names, but this shows you the information you get each week. It’s nice because it gives you that quick and painless reminder on the kids you need to check in with and maybe talk with about their effort during that time. You also can print out parent sign ups so parents can get information on their kid’s performance. I’ve not used this yet so I’m not sure the frequency or anything. 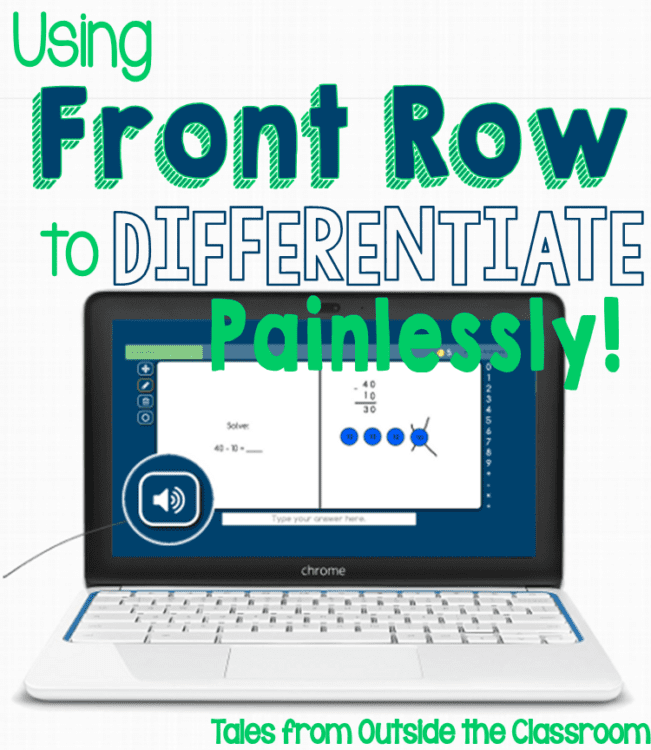 I truly, truly love Front Row and love how easy it allows me to differentiate for my kids! If you’re already using it I’d love to hear about it! Thanks for explaining this so clearly. I set up my kiddos' accounts and even one for myself, so I had some kind of clue what I was doing. It looks terrific! I'll be starting tomorrow morning! After you've used it a few times I'd love to hear what you think and how it's working out for you all! I had never heard of this. Love it. Thanks for sharing. You're welcome! I hope you love it. I hope it works out well for you and your students. Thanks so much for sharing this! I can't wait to try it! I hope it works out well for you and your students, Sally! I just got my class signed up and am ready to start this tomorrow! Thank you; I've been looking for a new math site to catch their interest! I'd love to hear what you think after you've all worked with it for a little bit. I know right?!?!? I still can't believe it's free! This sounds similar to Sumdog…have you used it? I just enrolled my class this past fall on Sumdog (they enjoy it still)… wondered how this compares…. thanks for sharing! I haven't used SumDog enough to really be able to compare the two. I found it to be too confusing so I didn't get it going with my students. Thanks for sharing! I'm going to sign up and use with my students after spring break! Just signed up. Looks great for a middle school teacher teaching 6-8th grade. I am excited to use it when we start stations after our Standardized testing is over. Thank you. You must be trying to download the app from Apple. You shouldn't have an issue using it on the website. I don't have an iTunes account. This looks amazing…..thank you so much for sharing! Thank you so much for sharing. This looks amazing! Thanks so much for sharing you referral! I've been looking for less expensive alternatives to IXL and Math Whiz. Thank you for sharing this amazing site and for sharing your referral! I'm setting up my classes right now! Looks like a very useful program! I'm going to give it a try!! Thanks for sharing! This is really, really, cool. I'm going to share it at my PD tomorrow. How do you get more referrals? It says I only have 5. I got more referrals by contacting them. But if you were doing it within your staff, once you refer a few people, those people could also be used as referrers for the rest of your staff because that would be 25 referrals. You get them pretty automatically after signing up. When it tells you that you have five referrals left, it means how many people you can refer yourself, not that you need additional referrals. Can't wait to try this out with my kiddos! Thank you for sharing a great resource. Wow! What a great website! Thanks for sharing! Thanks for the write up and providing your email as a referral address! My kids love it and practice in one domain just wasn't going to cut it. I'm so excited to start using First Row! My kiddos are growing tired of Sumdog and Study Island! Thank you so much for sharing! Thanks for sharing! I can't wait to use this with my students! !